One year on from the Papal visit to the UK and the word on the lips of many Catholics is ‘confidence’. The Archbishop of Westminster has encouraged Catholics to join him in a weekend of celebrations, remembering the special events that took place in London and in England and Scotland in 2010 during the Pope’s Visit. 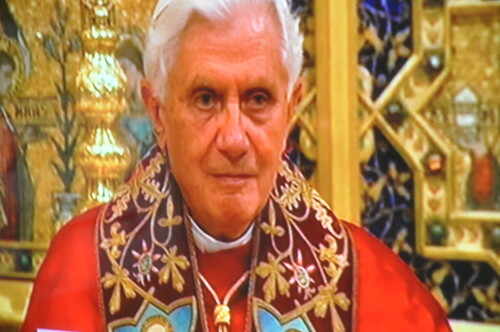 The Mass of Thanksgiving, at Westminster Cathedral, for the anniversary of the State Visit of Pope Benedict XVI to the United Kingdom will be attended by those who made a particular contribution to the organization of the original visit. All of the Bishops of England & Wales, along with all seminarians, will attend remembering the historic meeting of the Holy Father with the Bishops and seminarians at St Mary’s College, Oscott, on 19 September, 2010. The Government will be represented by officials headed by Simon Martin, the Director of Protocol for the Foreign and Commonwealth Office, accompanied by the Ambassador to the Holy See, Nigel Baker. The Archbishop of Canterbury and the Church of England will be represented by the Bishop of St Albans. Other celebrations of the anniversary in Westminster diocese will include a special evening for young adults held at Maria Fidelis School and St Aloysius Church NW1 to reflect on the messages Pope Benedict shared with us. In Barnet’s Mary Immaculate and St Gregory Church, the New Translation of the Mass will be used as the focus during a ‘festival Mass’ commemorating the Holy Father’s visit. This will be the only Mass celebrated at Mary Immaculate and St Gregory Church on Sunday 18 September, in an aim to bring the whole parish together. Friday 16 September marked the re-introduction of Friday penance, with the Bishops Conference asking Catholics to abstain from eating meat. Friday is set aside as a special day of penitence, as it is the day of the suffering and death of the Lord. If people do not usually eat meat, then they are encouraged to abstain from eating something else that forms a regular part of their diet. The hope is that Friday Penance will have a similar effect to the Pope’s visit, in unifying British Catholics. This message of having confidence to come together to worship the Lord, to give thanks for the Papal visit and build upon the lessons learned through it, is supported by the fact that Sunday is Home Mission Sunday. Home Mission Sunday focuses on praying for the work of evangelisation and how people share the values of their faith in positive ways. The theme of Home Mission Sunday this year is ‘Fresh Wind In Our Sails’ which is what the Holy Father is reported to have said his visit to the UK gave him. Home Mission Sunday will be an occasion to draw strength from the Papal visit, and his enjoyment of it, that will help Catholics to feel confident in our ongoing journey of faith.